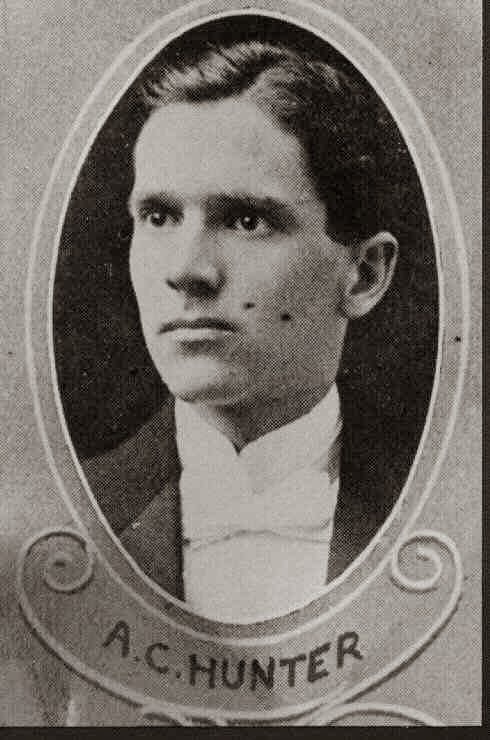 1-Charles Jefferson Hunter ,1 son of William A. Hunter  and Emaline Ray , was born on 3 Sep 1865 in , Macon Co, NC, died on 15 Feb 1954 in Woodstock, Cherokee Co, GA at age 88, and was buried in Carmel Baptist Church, Woodstock, Cherokee Co, GA..
General Notes: Charley owned Hunter's Store. In the store was a small post office of the community of Kelp, which he was the postmaster. He also wrote a weekly local society/gossip column for a Canton newspaper. The name of the column was Hunter's Store. Charlie Hunter had his sale Jan 31, 1917 and moved in the house with his father. - From Minnie Durham Westmoreland's journal, p7. Charles married Paraline Victoria Dobbs  [MRIN: 292], daughter of Franklin Dobbs  and Clarissa Mayfield . Paraline was born on 25 Oct 1861, died on 30 Jun 1897 in Woodstock, Cherokee Co, GA at age 35, and was buried in Carmel Baptist Church, Woodstock, Cherokee Co, GA.. They had four children: Clara Victoria, Alfred Charles, Dolly Mae, and Eva Bell. 2-Clara Victoria Hunter 1 was born before 1891 and died on an unknown date. General Notes: Marj remembers meeting Clara in 1935, but her husband wasn't around (she thinks that he must had died before then). Clara had two boys, one of which was a doctor and the other (youngest) died in England during WWII, and one girl, who may have moved to Memphis, TN. Clara married ____________ Turner  [MRIN: 293], son of ____________ ____________ and ____________ ____________. 2-Dr Alfred Charles Hunter  was born on 15 May 1891 in , Cherokee Co, GA and died on 3 Nov 1973 in Kerrville, , Tex at age 82. Alfred married Mamie "May" Akridge  [MRIN: 294], daughter of ____________ ____________ and ____________ ____________. Mamie was born on 18 Oct 1892 in Summerville, , GA and died on 18 Apr 1933 in San Antonio, , Tex at age 40. They had one son: Akridge Charles. 3-Dr Akridge Charles Hunter 2 was born on 26 Jul 1917 in Pleasanton, , Tex and died on 14 Jan 1997 in Houston, , TX3 at age 79. General Notes: Akridge and his wife Helen attended the Hunter Reunion in Marietta in the early 1980s. Akridge married Helen Crain  [MRIN: 295], daughter of ____________ ____________ and ____________ ____________, on 18 May 1946. Helen was born on 4 Aug 1920 in Pleasanton, , Tex and died on 7 Apr 2003 in Richmond, , VA at age 82. They had three children: Josane Elaine, Paula Jean, and Holly Ann. 4-Josane Elaine Hunter  was born on 14 Dec 1950 in San Antonia, , TX. Josane married Kenneth Alan Wagner 2 [MRIN: 296], son of ____________ ____________ and ____________ ____________, on 16 Jun 1973. Kenneth was born on 14 Jan 1848 in Fort Lewis, , Wa. They had two children: Jovan Elaine and Rachel Michelle. 4-Paula Jean Hunter  was born on 5 Jan 1954 in San Antonia, , TX. Paula married Nathan Rakestraw  [MRIN: 297], son of ____________ ____________ and ____________ ____________. They had one son: Ryan. 4-Holly Ann Hunter  was born on 12 Sep 1957 in San Antonio, , TX. Holly married Daniel Clff Huston  [MRIN: 8289], son of ____________ ____________ and ____________ ____________. Daniel was born on 29 Jun 1955 in , , AK. They had two children: Lana and Hayley. 2-Dolly Mae Hunter  was born after 1892 and died on an unknown date. 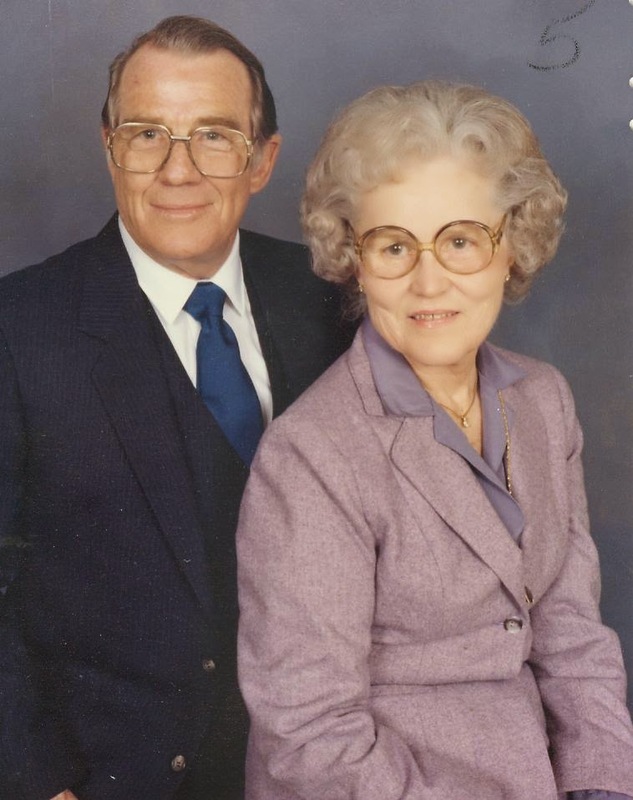 General Notes: Dolly Mae was a school teacher and her husband was wheelchair bound. Dolly married ____________ Pips  [MRIN: 298], son of ____________ ____________ and ____________ ____________. 2-Eva Bell Hunter 4 was born on 21 Aug 1895,4 died on 30 Jul 1973 in Beaver. . PA4 at age 77, and was buried in Sylvania Hills Cemetery, Rochester, PA.
General Notes: I'm starting to do some research into my grandmother's family. Sadly ma ny details are missing from the oral history that she was left with. Her mother was Eva Bell Hunter (born 8/21/1895), who was the daughter of C harles Jefferson Hunter and Paralee Dobbs (who died when Eva was 2, so 189 7/1898). My grandmother says that Eva had a brother that moved to Texas a nd was a dentist. I belive this person is the A.C. Hunter you mention ed in your blog last October. Any information you could share with me regarding Charles Jefferson Hunt er and his family, so that I can confirm or rule out this relation, wou ld be most appreciated! • She was employed in Homemaker. Eva married J. Harvey Poor 4 [MRIN: 299], son of ____________ ____________ and ____________ ____________, on 25 Jun 1920 in , Fulton Co., GA.4 J. was born on 25 Mar 1896 in Holly Springs, , GA,4 died on 30 Jul 1969 in Aliquippa, , PA4 at age 73, and was buried in Sylvania Hills Cemetery, Rochester, PA. They had three children: Marjorie Lee, Elizabeth Rae, and Harvey Eugene. Marriage Notes: Rumor is that Eva's father Charles did not approve of Harvey - he thoug ht Eva was marrying beneath her. • He was employed in Machinist. 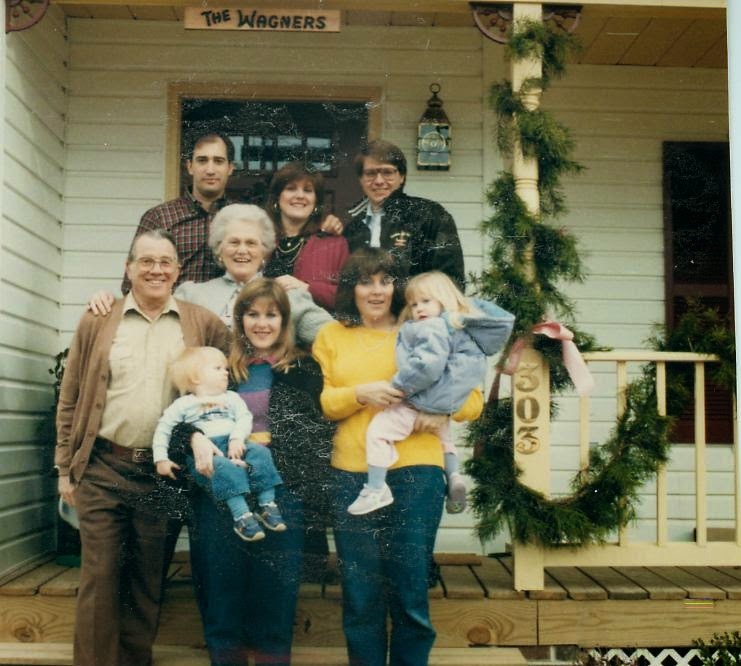 3-Marjorie Lee Poore 4 was born on 18 Feb 1922 in Atlanta, Fulton Co, GA and died on 17 Jan 2012 at age 89. General Notes: Marj worked primarily as a homemaker, although she did office work duri ng the war. She would stay with her parents during the week and work, a nd then go by train to stay with John's family on the weekends. She also b riefly worked outside the home after they relocated to Chattanooga. Aft er John's death, she moved in with her daughter Margie. She is very acti ve in her church and keeps busy with sewing projects for her grandchildr en and great-grandchildren. Marjorie Lee Poore Osborne, 89, of Chattanooga, went to be with her Lord on Tuesday, Jan. 17, 2012, at her home surrounded by family.Marj was born Feb. 18, 1922 in Atlanta, was raised in Aliquippa, Pa., and was a longtime resident of Chattanooga. She was a dedicated and active member of First Alliance Church.She was preceded in death by her loving husband, John Osborne; parents, J. Harvey and Eva Hunter Poore; brother, Eugene Poore; and sister, Betty Johnson.Survivors include two daughters, Margie (Ed) Talley of East Ridge and Marian (Gary) Sullivan, Knoxville; four grand-daughters, Christie Sullivan, Katie (Gary) Murray, Michelle (Jeremy) Kittle, and Jennifer (Terrell) Stallings; six great-grandchildren, John and Jordan Kittle, Taylor and Ty Stallings, and Sarah and Kaitlyn Murray; and beloved nieces and nephews.Visitation will be from 4 to 8 PM on Thursday at the funeral home.Funeral services will be at 10:30 a.m. Friday, Jan. 20, 2012, at the funeral home with Rev. Lee Peters officiating.Burial will follow at Chattanooga National Cemetery.In lieu of flowers, memorial donations may be made to Mahaffey Camp (P.O. Box 277, Mahaffey, PA 15757) or First Alliance Church (1906 Hickory Valley Road, Chattanooga, TN 37412).Please share your condolences at www.chattanoogaeastchapel.com.Arrangements are by the East Chapel of Chattanooga Funeral Home, Crematory and Florist, 404 South Moore Road. Marjorie married John Patterson Osborne 4 [MRIN: 8449], son of Luke Osborne  and Edna Muirhead , on 31 Aug 1942 in Cumberland, , MD.4 John was born on 10 Oct 1918 in Fayette City, , PA4 and died on 11 Sep 1997 in Chattanooga, , TN4 at age 78. They had two children: Margie Louise and Mariane Faith. Marriage Notes: Marj & John met in 1940 at Mahaffey Camp, a Christian & Missionary Allian ce camp in Mahaffey PA. John's sister Isabella had been helping take ca re of a relative in Aliquippa, and met Marj. Isabella then introduced Jo hn to Marj at camp. General Notes: Margie attended Techoa Falls College for 1 year. She worked for years at C hubb Insurance in Chattanooga, but was laid off in the 1990s. She took t he Civil Service exam and has been working at the National Cemetery in Cha ttanooga since then. Margie married H. Edgar Talley 4 [MRIN: 8450], son of Hosmer Talley  and Belle ____________ , on 8 Nov 1974 in Ringgold, , GA.4 H. was born on 16 Apr 1942.4 They had one daughter: Jennifer Lynn. Mariane married Gary Leslie Sullivan 4 [MRIN: 8452], son of Irvin Sullivan  and Jessie Mae Bass , on 24 Aug 1968 in Chattanooga, , TN.4 Gary was born on 14 Dec 1946 in Nashville, , TN.4 They had three children: Christina Lynn, Katrina Ann, and Michelle Lee. 3-Elizabeth Rae Poore 4 was born on 23 Aug 1923 in Aliquippa, , PA,4 died on 24 Nov 2011 at age 88, and was buried in Cremated. General Notes: Betty was a postmistress. I wanted to let you know that my great-aunt Betty pasted away (Elizabeth Rae Poore Johnson) this past Thursday. She's been having kidney issues since late summer, and died during a "routine" kidney stone procedure. Her body is being cremated (like her husband's was) and the family is having a memorial service this Friday in Brookville, PA. Here is the link for the obituary, although there is not much to it. Elizabeth R. Johnson, 88, Route 36, Sigel, died Thursday at the Brookville Hospital. Arrangements are under the direction of the McKinney Funeral Home, Brookville. Elizabeth married Leonard Boone Johnson 4 [MRIN: 8455], son of ____________ ____________ and ____________ ____________. Leonard was born on 19 Aug 19194 and died in Sep 20074 at age 88. They had two children: Virginia Lee and Ralph Leonard. 4-Virginia Lee Johnson 4 was born on 31 Mar 19404 and died in Oct 19864 at age 46. Virginia married Anthony Henry Cozzocoli 4 [MRIN: 8456], son of ____________ ____________ and ____________ ____________. Anthony was born on 9 Oct 1922 and died about 19934 about age 71. They had one daughter: Shelia Renee. Virginia next married John Edward Kosto 4 [MRIN: 8457], son of ____________ ____________ and ____________ ____________, on 7 Apr 1962 in Aliquippa, , PA.4 The marriage ended in divorce. John was born on 24 Feb 1941. They had one son: Richard Benton. General Notes: dvc 1970s; md long-time live-in girlfriend 2006/2007. Ralph married Carol Ann Sutton 4 [MRIN: 8459], daughter of ____________ ____________ and ____________ ____________, on 14 Jul 1961. Carol was born on 21 May 1942 in Aliquippa, , PA.4 They had two children: Lee Scott and Lynn Suzanne. 3-Harvey Eugene Poore 4 was born on 29 Nov 1928 in Aliquippa, , PA4 and died on 4 Apr 1973 in Aliquippa, , PA4 at age 44. Harvey married Anita Certone 4 [MRIN: 8460], daughter of ____________ ____________ and ____________ ____________, on 16 Jun 1949.4 Anita was born on 16 Nov 1928 in Woodlawn, , PA.4 They had three children: Mary Ann, Michael Harvey, and Raymond Edward. • She was employed in Hairdresser. Mary married John Gress III 4 [MRIN: 8461], son of ____________ ____________ and ____________ ____________, on 15 Dec 1973 in Aliquippa, , PA.4 John was born on 9 Aug 1949 in Sewickley, , PA.4 They had one son: John Harvey. • He was employed in Steel Worker. Michael graduated from Penn State with a programming degree. • He was employed in Business Systems Analyst. Michael married Susan Marie Alimena 4 [MRIN: 8462], daughter of Unknown, on 17 Sep 1977 in Sewickley, , PA.4 Susan was born on 13 Mar 1954 in Sewickley, , PA. They had one daughter: Ashley Marie. General Notes: Ray is a draftsman and owns his own buisness, Poore' Construction. • He was employed in Draftsman. Raymond married Lynn Roppo  [MRIN: 8485], daughter of ____________ ____________ and ____________ ____________, on 25 Jul 1985. They had two children: Mitchell Michael and Garrett H..
Charles next married Letha Parr  [MRIN: 300], daughter of ____________ ____________ and ____________ ____________, on 4 Dec 1898 in , Cobb Co, GA.5 Letha was born on 5 Dec 1878, died on 17 May 1961 in Woodstock, Cherokee Co, GA at age 82, and was buried in Carmel Baptist Church, Woodstock, Cherokee Co, GA.. They had three children: Anna Laura, Katherine H., and Ruth H..
2-Anna Laura Hunter 2 was born after 1897 and died on an unknown date in West Palm Beach, , FL. Anna married ____________ Turner  [MRIN: 301], son of ____________ ____________ and ____________ ____________. Anna next married ____________ Davis  [MRIN: 302], son of ____________ ____________ and ____________ ____________. 2-Katherine H. Hunter  was born after 1898 and died on an unknown date. 2-Ruth H. Hunter  was born on 31 Jul 1917 in Woodstock, Cherokee Co, GA and died on 24 Mar 1965 in , Cherokee Co, GA at age 47. Ruth married Pete Mauldin  [MRIN: 303], son of ____________ ____________ and ____________ ____________. They had one daughter: Letha. 3-Letha Mauldin  was born after 1937. 4. Christie Sullivan email, Sept 22 2008.